Is it safe to add my loyalty cards in VirtualCards? Yes. Your virtual cards are safe in VirtualCards App. First, is very important to create an account in the App by completing simple information like your e-mail address and a password. Then you can add your loyalty cards. These will be saved and kept in your account, even if you change your phone or you reinstall your operating system. If you download the App again and you log into your account (with your e-mail and password) you will find all your virtual cards. Can I add a loyalty card in VirtualCards even if it’s not in the predefined list? Yes. All your cards have a space of their own in VirtualCards! At the end of the list with merchants, where you’ll see “Your card is not in the list?”, press “Add card” button. Complete with the name of the card and then scan or manually introduce the barcode or the numeric code. Later you can add photos for the front/back of your plastic card. It’s important that your plastic loyalty card has a barcode or a numeric code, not a magnetic tape. A card with a magnetic tape has to be physically used because it needs to be introduced through POS system (for example: loyalty cards at gas stations). Any store will accept my loyalty virtual card? Yes, loyalty cards on smartphones have become a trend. People won’t be surprised to see your virtual card when you pay. Also, most stores have new optic scanners, which can read barcodes from smartphones. The scanning is instantly, the store’s system will identify you based on that code. Everything is the same, except that instead of scanning a plastic card, the scanner will read the barcode from your phone. If the store has old scanner which cannot read your virtual card, then the cashier can manually introduce the numeric code shown on your virtual card from your phone. Will I get messages and offers from stores I don’t know or I’m not interested in? 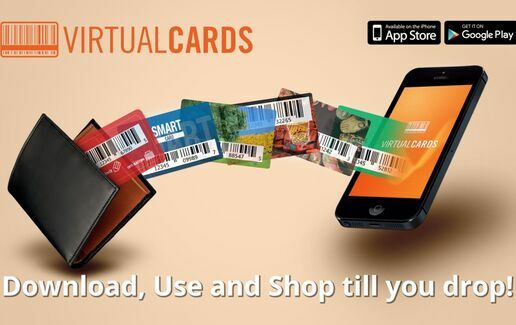 VirtualCards App offers information about stores from which you already have a loyalty card. You get notifications and discounts only from your favorite merchants. Plus, the notifications are entirely managed by you, so you choose from what shops you will receive messages with offers. What advantages do I get if I use virtual loyalty cards? You will always have access to all your loyalty cards, whenever you need them. You won’t need to search for plastic cards in your bag or in your wallet and there is no risk to forget your loyalty cards at home. I’ve accessed the App and I cannot find my loyalty cards. What can I do? By creating an account with your e-mail address and a password, you save and keep all your loyalty cards. If after a while you have been disconnected, you need to log in with the e-mail address and password you used to create your account. If you have used VirtualCards without creating an account, which does not guarantee the safe keeping of cards in time, please send us an e-mail at contact@virtualcardsapp.com to help you get back your lost cards. I have a different question. How can I get in touch with you?